The Park Railway Dresden - Dresdner Parkeisenbahn e.V. "Home" > "The Park Railway"
Visitors entering the park "Großer Garten" (English: "Great Garden") are often amazed as unrecognisable sounds and the energetic signal of a locomotive disturbs the idyllic peace and thick clouds of smoke rise up into the crowns of the trees. The solution to this puzzle is the park railway, a miniature railway with 381 mm gauge which takes thousands of small and large passengers on a trip through the park during the summer months. Special about this railway is that it is operated by children and young people in their free time. 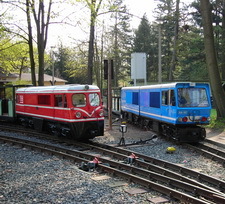 Already in the early thirties of the last century a miniature railway ran as a special attraction to the Hygiene and Garden Exhibition on the site of the park "Großer Garten". After the city had seen years of railways carrying rubble away from the city following 1945, memories of the old steam railways resurfaced in the city´s consciousness "International Children´s Day" in 1950 was the perfect occasion to make the children´s railway operating again. In that same year the first stretch went into service. In 1951 it was renamed the "Pioneer´s railway" and was extended to 5.6 km. From this time onwards, most of the service roles have been carried out by children, many of today´s train drivers caught the railway bug in their childhood here. In 1990 the Pioneer´s railway was renamed: "Dresden Park Railway" and in 1993 incorporated into "Schlösser und Gärten Dresden". The train takes playgroups and school groups to the zoo, the palace ponds or to events in the open air stage in comfort and at a low price. In the event of inclement weather, covered or closed carriages offer protection. As well as Father Christmas tours, the annual "Open doors day" is particularly popular, but romantic night time journeys are also in the calendar. The stretch passes through a charming area of the Great Garden. There are lots of things to discover on the way: The animal enclosures in the zoo, the impressive palace and lake Carola, where passengers can take a gondola ride. 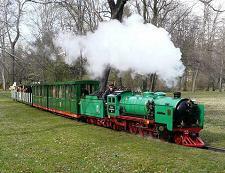 It is not only children who will be enchanted on the half hour round journey - adults can sit back and relax and enjoy reminiscing on their own childhood, as the small train hurries through the park at 20 km/h (12 mph).